Household survey data provide a rich information set on income, household context and demographic variables, but tend to underreport incomes at the very top of the distribution. Administrative data like tax records offer more precise information on top incomes, but at the expense of household context details and incomes of non-filers at the bottom of the distribution. We combine the benefits of the two data sources and develop an integrated approach for top-corrected income distributions where we impute top incomes in survey data using information on top income distribution from tax data. We apply our approach to European EU-SILC survey data which in some countries include administrative data. We find higher inequality in those European countries that exclusively rely (Germany, UK) or have relied (Spain) on interviews for the provision of EU-SILC survey data as compared to countries that use administrative data. 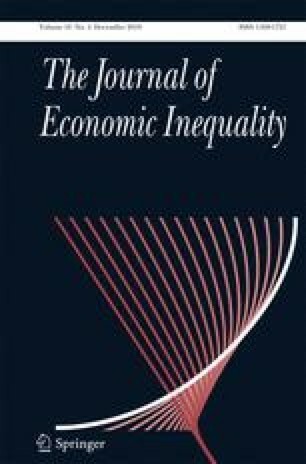 The online version of this article ( https://doi.org/10.1007/s10888-018-9394-x) contains supplementary material, which is available to authorized users. This paper has greatly benefited from the suggestions of the editor, two anonymous referees and Carsten Schröder. We thank Martin Biewen for valuable comments and participants of the 2016 conferences of the Society for Social Choice and Welfare (SSCW), the European Economic Association (EEA), the International Institute of Public Finance (IIPF) and the German Economic Association (Verein für Socialpolitik) as well as the 2017 meeting of the Society for the Study of Economic Inequality (ECINEQ) and Journées Louis-André Gérard-Varet (LAGV) for insightful discussions.